Since I was 12 I made it my quest to find the world’s best beaches. I told everyone I’d have my bungalow by the ocean with tons of palm trees. I’ve been to some gorgeous ones, from Maldives, Cook Islands, Bora Bora and beyond. When I married I told my husband retirement included warmth, turquoise water and palm trees. After traveling the world, I found Grace Bay Beach to be the one! I never get tired of those gorgeous neon hues! Save money staying only blocks from the beach in a quiet setting without giving up luxury . Pack the cooler and find your own secluded stretch of Leeward/Pelican Beach and search for giant conch shells to bring back home. Enjoy happy hour at the pool tiki bar with palm thatch roof before heading out to dinner. 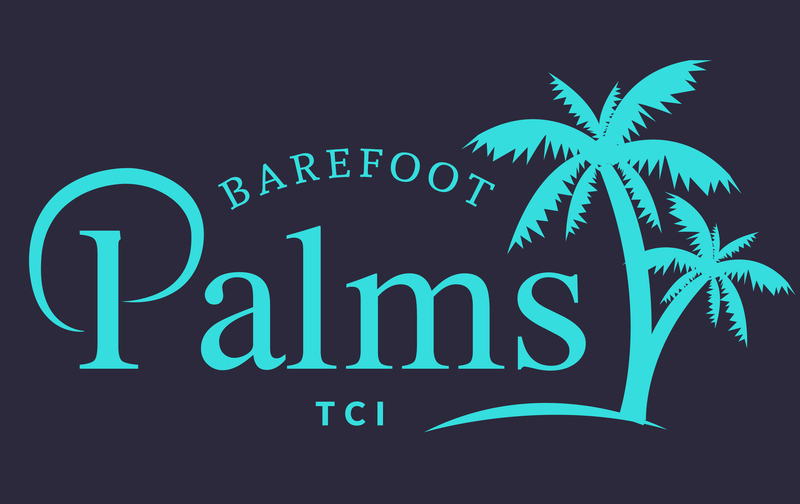 Barefoot Palms is casual and laid back yet elegant with travertine tiles, granite counters and stainless steel appliances. Every room has soaring high cathedral ceilings and open living space. The huge master bedroom has a king size bed , walk in closet and writing desk area. 2 other bedrooms have queen size beds; great for families or 3 couples. Each bedroom has its own TV, Cable and DVD players. There’s access to Netflix, Hulu and Amazon Prime. Individual A/C units in each bedroom and the rest of the house has central air. The open kitchen/dining/living rooms will have you cooking eating and entertaining with all utensils and an extensive movie library. There’s a Bluetooth Soundbar for music and recent best selling books for reading enjoyment on the beach. There are small tropical touches throughout with Tommy Bahama furniture, palm tree and shell cabinet handles, and colorful fish switch plates. It’s hard to break away from the huge backyard patio with a pool and the best feature, a tropical tiki hut bar!